By	Allyson Haymaker. Last edited by Marios Alexandrou on September 27, 2018. I thoroughly enjoyed a recent visit to stately Boone Hall Plantation near Charleston, South Carolina. Established in the 1680s by Major John Boone (no relation to Daniel! ), it's one of America's oldest working plantations. My cousins and I were impressed by the long driveway lined with Spanish moss-draped live oaks. The plantation's centerpiece is a gracious mansion, built in 1935 with bricks made on the plantation (it's the fourth home to stand there). A guided tour took us through the home and out to slave cabins, where we met a woman weaving baskets out of sweet grass, pine needles, bulrushes and shredded palm fronds. The traditional basket designs were brought here from Africa, and the baskets smelled so good–no wonder it's called sweet grass! Years ago, the plantation produced cotton and pecans. Today, it yields peaches, strawberries and other fruits and vegetables. You can pick your own produce in season; we picked peaches that were absolutely delicious–sweet and juicy! 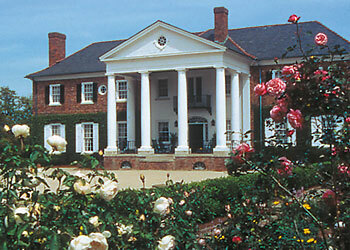 Boone Hall Plantation is about 8 miles northeast of Charleston and just north of U.S. Highway 17 on Long Point Road. Admission is $14.50 for adults and $7 for children ages 6-12. A tour of the vast grounds in an open-air tram ride is available for $5 a person; children under age 5 are not allowed. From April through Labor Day, the plantation is open for tours from 8:30 a.m. to 6:30 p.m. Monday through Saturday and 1-5 p.m.; slightly reduced hours the rest of the year. For more information, call 1-843-884-4371.